The hyacinth flower is well-known among gardeners and flower enthusiasts for its sweet, earthy and robust scent. The plant’s fragrance is so sweet, in fact, that it acts as a natural deterrent from animals and pests that may otherwise find its bright bulbs quite enticing. These blossoms make stunning additions to bouquets, as exemplified by Teleflora’s Spring Equinox and Spring Favorites arrangements. For a fruity scent delivered in a colorful package, look no further than the freesia. According to Balcony Garden Web, these blossoms are popular among European florists, who favor the flower for its wine-like aroma. Freesias can be grown in a variety of colors, including white, like in Teleflora’s Spring Rhapsody bouquet, and hot pink, like in the Roman Holiday arrangement. Who among us doesn’t love to stop and smell the roses? There’s a reason these flowers have become synonymous with rich, luxurious fragrance – they’re truly nature’s perfume. Roses are just as versatile as they are sweet-smelling, and can be incorporated into bouquets for any occasion. For a sunset color palette, check out the Blossoms in Vogue arrangement. Evoke classic romance and old Hollywood glamor with the Always on My Mind Long Stemmed Red Roses bouquet. When peony season rolls around, be sure to pick yours up right away! This blossom is only in bloom for a fleeting amount of time, typically between April and June. The wait is worth it, however – these colorful buds are packed with sweet fragrance. 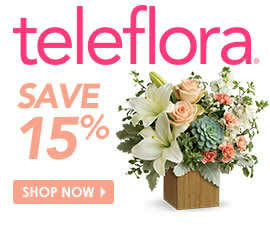 Get your peony fix with Teleflora’s Perfect Peonies and Teleflora’s Pretty in Peony arrangements. Often used as a fragrance in perfume, lotion and other bath products, sweet pea flowers deliver a light yet wholesome aroma. Fresh sweet peas provide a smell that mixes nicely with other florals and classic buds that fit neatly into any arrangement. Show your friends and family you love them by gifting this delicious fragrance, available in Teleflora’s Isn’t It Romantic and Kensington Gardensby Teleflora arrangements. Lilies have long been a go-to fragrant floral. These dramatic, open buds fill any space with their yummy, enticing perfume. Lilies are grown in many colors, and are perfect for all occasions. One of the most popular arrangements among Teleflora’s lily lovers is the Always a Lady bouquet, which features stunning pink blossoms. For a touch of whimsy, check out the enchanting Yellow Fellow arrangement. Summer is full of amazing scents, and these are just a few flowers that will bring the season inside. Tell us below what flowers are your favorite! Great summer options for fresh cut flowers. We sell lots of these in our flower shop in Battle Creek, MI. The peony is our personal favorite.